Bee feeders come in all shapes and sizes, a variety of materials, complexity, price, feed capacity, bee capacity and feed speed; some you can make yourself and some you shouldn’t even try! Rapid feeders are used to get feed (syrup or inverted sugar bee feed) into the bees as quickly as possible – generally after the removal of the honey harvest and/or in the autumn before winter sets in. A strong 2:1 syrup is easier for the bees to ripen – less water for them to remove. Bee feeds such as Ambrosia are thicker still and the inverted sugar is better for the bees. Mostly, the design is that of a waterproof box with the same horizontal dimensions as the hive type so it can sit like a super – over the brood box and under the roof. These feeders have the greater feed capacity. There are various clever ways of admitting bees and preventing them from drowning. The best of these feeders have a capacity of about 2.5 gallons so a winter feed can be given in one go. They each have feeding gallery consisting of a slot running the complete width of the box to allow many bees up into the feeder where cunningly spaced baffles prevent them from drowning. There should also be a beespace underneath which allows the feeder to be seated quickly and properly atop the brood box without crushing bees and avoiding the need to scrape off every little knob of beeswax. If there is no bee space, these feeders will need to be carefully set so the feed slot lines up correctly to allow bees access especially if you are using castellations. A Miller feeder has the feeding gallery running across the centre of the box with feed chamber each side. These feeders are the most rapid of all rapid feeders because each of the two chambers has its own 420mm long feeding gallery – that’s 840mm altogether. If you allow a generous 4mm per bee that’s space for 210 feeding bees at any one time. The Ashforth feeder has the feeding gallery at one side so there is only one feed chamber and only 420mm of feeding space. That’s 105 bees at any one time. Hold a full winter feed in one go. Will accommodate the highest number of feeding bees at any one time. Wooden ones need maintenance unless they are cedar. May not have bee space underneath. Plastic rapid feeders are now on the market. They have evolved from a design originated by Brother Adam and incorporate a centrally placed conical, access chimney topped with a diving bell-like cap which allows the bees up and at the feed without them drowning. They come in two sizes 6 litre/10.5 pint rectangular round 2.25 litre/4 pint. Both designs can be placed on top of a standard crownboard over the feed hole. The larger size can accommodate up to 85 bees feeding at one time and the smaller one only about 50 so neither of them is anywhere near as rapid as the Miller or Ashforth feeders. Only relatively rapid! The advantage of these feeders is they are lightweight and cheap. They are small enough that you can keep a few tucked away in the van at all times just in case. Another possible disadvantage, unless you have lovely deep roofs is that these feeders need to be placed inside an empty super. Another type of rapid feeder is the frame feeder. A frame feeder, as the name suggests is a narrow box shaped like a frame and designed to sit inside the brood box. Frame feeders are equipped with a raft-like float that sits inside the feeder on top of the syrup and prevents the bees from drowning. The interior dimensions allow for between 80 and 160 feeding bees – assuming the float hasn’t washed up tight against one side or the other and the bees are feeding from both sides. That’s quite fast! They are particularly useful for feeding nucs and observation hives. Disruptive. The very small feed capacity plus the large number of possible feeding bees means these feeders need to be topped up often and this involves disturbing the bees each time. This is the cheapest of all rapid feeders. Get a plastic bucket and sit it on the crownboard inside an eke – either an empty super or broodbox. Pour strong syrup into it till about three quarters full. Get a good double handful of straw and plunge it into the syrup then pull some sodden straws out and drape them over the lip of the bucket so they dangle into the feed hole. Primed thus, the bees will come up pretty quickly and soon drain the bucket. The straw will stop them from drowning. Don’t over-prime or you’ll have syrup running through the mesh floor and that will attract robbers. Very fast feed-speed in good weather. If the weather is chilly the bees will be unwilling to climb all that way up into the attic to feed. Contact feeders can be used in autumn but they are better for spring or stimulative feeding. Stimulative feeding is where you are trying to mimic a nectar flow and get the queen laying so you are aiming for a slowish drip feed with a weak 1:1 syrup. They consist of a bucket or other container with a gauze window or perforations in the lid. When inverted over the feed hole in the crown board, the vacuum inside the container prevents syrup running out. A lid with a good airtight seal is essential. These feeders can be purchased in several different sizes or are easy enough to make at home. According to Hooper they are called contact feeders because you can invert them directly over the top bars of the brood box. If you do this you will need an eke – obviously – and you will need to pack the space around the feeder with sacking or old jumpers. Bees won’t use them in cold weather and may propolise them in a long cold spell. 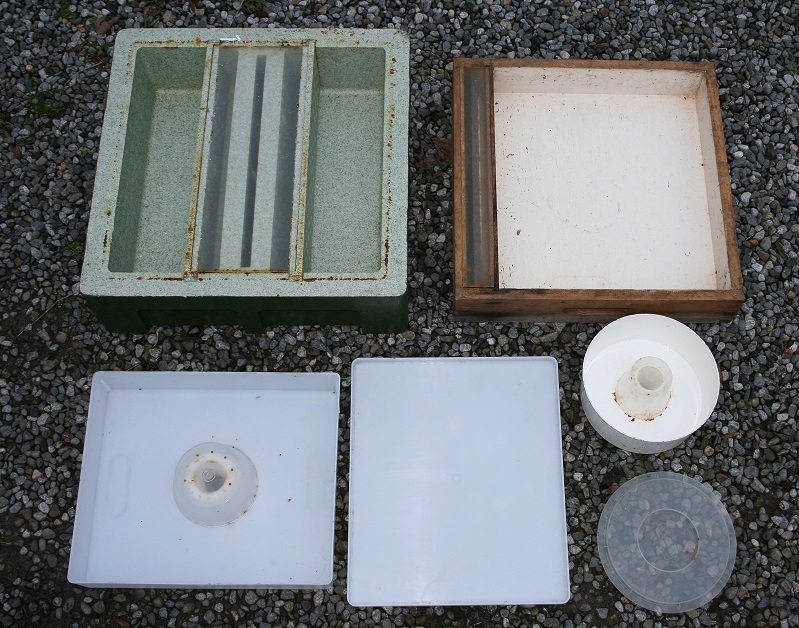 They are similar to contact feeders in that they consist of a container with a gauze window or perforations in the lid through which the bees can take syrup when the container is inverted. The container has an attachment so it can fit in the hive entrance like a baby’s dummy. Entrance feeders are only of use in summer, or other warm weather, as bees will not otherwise leave the cluster, let alone the hive. Don’t have to open hive and disturb the bees when checking levels or refilling. Bees will only use it when it’s warm and will not otherwise leave cluster. When feeding bees check for slope. If the hive is sloping when the feeder is placed on top, gravity will act on the syrup and unless the feeder goes on the right way round it can leave a pool out of reach of the bees. When using contact feeders the hive should be as level as possible as there can be dripping followed by trickling and it’ll seep out all over the place. Take a marble with you – it’s smaller than a spirit level. Before the days of mesh floors, it was recommended that hives always slope slightly to the front so water couldn’t run in or if it did get in – it could run out again. If you have solid floors you should do this as bees hate damp but chalk brood and acarine love it. So I was going to try syrup but winter or spring feed? If they haven’t eaten your fondant – either they don’t need it or they are too weak to care. You could take a look inside and if the cluster is very small and close to the top you could place a thin pancake of Neopoll or some other pollen enriched fondant directly on top of them. Or you could spray the cluster with a little warm 1:1 sugar syrup but we’re talking intensive care here. Sometimes they are just too weak to save. I see why you might want to give them a thicker syrup but they might then need water to digest it…? 45 the first day maybe these did drown, 35 the next in very little feed. It’s an english feeder, I often notice them scrambling like mad as if they can’t cling on to the cone. No treatment, Hive alive. I’ll check the gap. Cheap Whitworths sugar from Dealz. Well, often some bees do drown. There should be grooves around the cone to give the bees grip. Make sure the little holes in the top of the cone cover are clear, or it can float – which wouldn’t help. If there is robbing going on there could be fighting up in the feeder. The sugar should be ok unless there’s an additive ie jam sugar which has pectin. I don’t know what else to suggest. O.k thanks for your time. the bees bits have been stuck to the crystallised sugar and they died. The syrup was clear going on.? Could it be possible that the bees drowned/died and the syrup crystallised around them? What type of rapid feeder – is the feeding part sufficiently narrow to prevent them drowning? Are you treating at the same time? Also – what sort of sugar did you use?